Some time now I’m contributing to Slingshot, the research Journal of the Society of Ancients (published since 1964). Above you can see two typical issues, at least since the collaboration began. 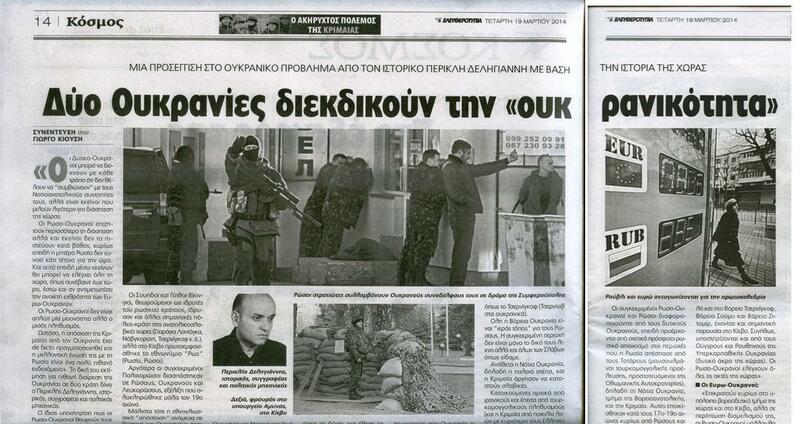 An indicative interview of mine in a Greek printed newspaper (“ELEFTHEROTYPIA”). The Spartan army, 12th c.-188 BC, Athens 2006. Ancient Chinese armies, Athens 2008. Julius Caesar : a biography, Athens 2008. Contribution to the collective: “Battle of Plataea, 479 BC”: The Greek Hoplite in 490-479 BC, Athens 2008. Cleopatra the Great : a biography, Athens 2009. Naval warfare of the Greek revolutionary war, 1821-1829, Athens 2009. The struggle between the Byzantine Empire and Islam, AD 634-1461, Athens 2009. Contribution to the collective: “Battle of Gettysburg, 1863” (American Civil war), Athens 2011. The Battle of Tripolitza, Peloponnesus 1821 (Greek Revolutionary war), Athens 2011. – Two Ukraines claiming the “Ukrainishness”, Eleftherotypia, March 19, 2014. – Turkey: the origins of political instability, Eleftherotypia, April 22, 2014. – Ukraine: the causes of modern disunity, Sunday E, April 27, 2014. What if: the Byzantines win the battle of Mantzikert, 1071. Battle of Colenso, 2nd South African war. Operation ‘Dragoon’, 2nd World War. Gela: a military machine of ancient Sicily. Gemploux 1940, 2nd World War. “Great Harry & ‘Revenge”: two famous English warships (16th c.). Battles of Kyme and Aricia (6th-5th c. BC, Etruscans against Italiote Greeks).